After his spectacular performance as Doodh Kasi guy in Yevade Subrahmanyam and Prashanth in Pelli Choopulu, the fate of Vijay Devarakonda has changed in overnight and became a star hero. 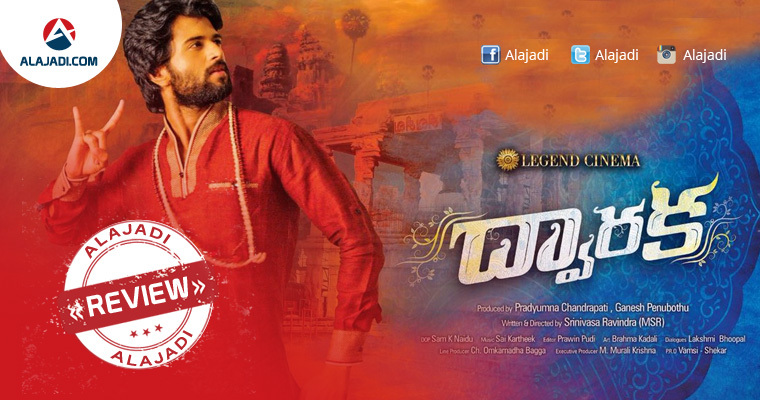 Now, the actor is back again with Dwaraka, in which he acted as Fake Baba. The story went on to be more interesting with the concept. There were many other movies which depict the same story but it is different than the previous film’s. The entire first will be interesting with comedy and romantic track. The story revolves around the life of a small thief Erra Sreenu (Vijay Devarakonda). One day, an unexpected robbery completely changes his life and some unknown people starts chasing Sreenu. Having no choice, he enters into an apartment named Dwaraka. After observing the people’s living style an idea strike his mind. With a little knowledge in magic, he starts attracting the people around there and made the people there believe him as baba. From then apartment people starts calling Sreenu as Krishnananda Swamy. One day, he fell in love with Pooja (Pooja Jhaveri) and he made all attempts to woo her. But one unforeseen incident changes the life of Erra Sreenu and the entire issue reaches to the Chief Minister of the State. The remaining story forms, what are the situations made him into fake baba? What is the trouble? How he overcomes the struggles? The movie is a one time watchable entertainer and makes you feel good even after watching the entire movie. The concept was old but the presentation is good. The Director did a good job and made the movie look good. You should go to theaters and watch the movie. Vijay Devarakonda: He mesmerizes the entire show with his ace acting. The actor has shown maturity in his acting skills compared to his previous movie. Pooja Jhaveri: She is OK with her glam show. The crew along with hero have also done a good job. All the other actors have done good enough to their characters. Directed by Srinivas Ravindra, the film has grabbed the eyeballs with the trailers and the songs. The film music is composed by Sai Karthik while Shyam K Naidu is Cinematographer and Brahma Kadali is Art Director. The film has completed censor formalities last year November itself and garnered a ‘U/A’ certificate. The chase between the hero and villain batch comes in the second half and leads to an interesting and nail biting climax. Though there are some boring elements in the second half, that director might avoid, but the overall presentation is good.